United Methodist giving is about people working together to accomplish something bigger than themselves. In so doing, we affect change in the world in the name of Jesus Christ. We do this in our individual congregations, of course. In Minnesota, approximately 90 percent of every dollar put into in the offering plate supports the work of the particular United Methodist congregation that received it. The rest goes beyond our walls to help heal a broken world. “First-mile giving” refers to local churches’ funding of worldwide mission projects and personnel through the payment of apportionments, “a portion meant for others”. Apportionment funds that leave Minnesota are used to build new churches, hospitals, and schools; pay missionary salaries; provide youth ministry leadership; start agricultural programs; enrich 11 historic black colleges; pave the way for students from developing countries; and more. “Second-mile giving” refers to local churches’ giving over and above apportionments to many missions and ministries to which they feel particularly called. Second-mile giving is done through “The Advance,” an official program of The United Methodist Church. One-hundred percent of all gifts made through the Advance go to the intended project or recipient. General Advances refer to more than 1,000 “Advance” projects that United Methodists support. They are located in 80 countries and 21 states (beyond Minnesota), and they are administered through the General Board of Global Ministries. Learn more and search for various Advance projects. All Feathers Ministry, Inc. in Cass Lake is an ecumenical ministry that primarily serves people of the Leech Lake Indian Reservation. It offers worship, Bible studies, children’s and youth ministries, and Native American spiritual retreats. Call 218-339-2808. Apparent Plan is a nonprofit that provides health promotion programs and advocacy services for older adults and their families. Learn more. Banyan Foundation in Minneapolis helps prepare youth in the Phillips neighborhood for high school and college. Camp Minnesota is the camping ministry of the Minnesota Conference and comprises several camp sites. Camp Minnesota's mission is to provide quality camp, retreat, and conference experiences in which Christ is offered to as many as possible to raise up faithful disciples so the world is transformed. Center for Victims of Torture in Minneapolis provides services to torture survivors and advocates for public policy initiatives that aim to put an end to torture. Compatible Technology International provides guidance and technical assistance to rural poor people in the world through the application of simple, human-powered technologies. Department of Indian Work through the Interfaith Action of Greater St. Paul serves American Indians in the east metro by providing emergency services, academic tutoring, cultural enrichment, and health ministries. Feed My Starving Children packs and ships meals to hungry children and families in 70 countries throughout the world. Gathering House provides counseling, skills training, and UMC Bible studies to offenders in the Steele City Detention Center. Contact: Cindy Kennedy, 612-239-0247. Harbor House Crisis Shelter provides hospitable shelter transitional living, and services for homeless women and families in Superior, Wisconsin. Imara International provides education and life skills for teenage mothers in Kenya. Interfaith Action of Greater St. Paul unites churches and civic organizations to build a more just, safe, and livable East Metro for all and to help people overcome poverty and other barriers. International Child Care provides medical care for children in Haiti and the Dominican Republic. Contact Lori McBride at 651-208-9000. Metropolitan Interfaith Council on Affordable Housing (MICAH) works to expand affordable housing opportunities in the Twin Cities. Se Luz brings the light of Christ to youth in Guatemala through service and discipleship. 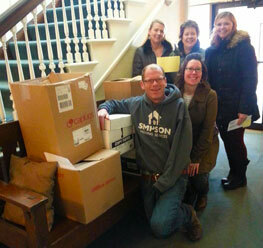 Simpson Housing Services helps men and women in Minneapolis make the transition to affordable permanent housing. For information regarding Advances related to Congregational Development, or to give to one of the 15 faith communities that are less than seven years old, contact Congregational Development Associate Gail Johnson.